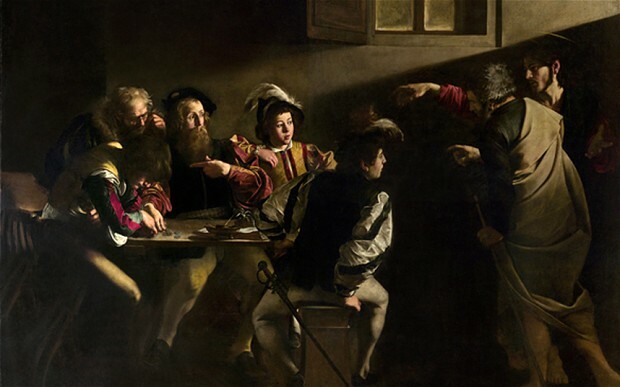 This article is Part 2 of a series on Historical Action, following on from Start Here: How to study Baroque Gesture and Historical Action here. The rehearsal and training exercises I describe in this article are ‘stepping stones’ towards historical gestures that you can use in performance. They are also designed to bring specific benefits to the music/speech. So the exercises are well worth trying in rehearsal, even if you choose not to use gesture in the final performance. The exercises are designed for 17th-century recitar cantando – the first Italian operas, English masquing airs, declamatory songs, recitative songs by Lawes, Purcell, etc. – but can of course be adapted for other repertoires, or for spoken drama, including Shakespearian blank verse. Before starting these exercises, choose a song (or opera excerpt) that you already know well, written in duple time. I will take as my working examples two solos from Monteverdi’s 1610 Vespers: Nigra sum and the opening solo of Pulchra es, but it should be clear how you can apply these exercises to whatever piece you want to work on. To start with, keep things simple with a song in duple time. I’ll cover Tactus-beating for triple meters in a future post, but you can read my suggestions about Proportions in general here, and about Proportions in Monteverdi’s Orfeo here. For a song lasting, say, three minutes, I’d recommend trying each of these exercises for the whole text, perhaps twice through for each exercise. The idea is to build up general familiarity with and fluency in these hand movements, rather than to perfect any one particular moment within the song. But it can be helpful to have a training partner or rehearsal director to observe and give you feedback about anything that could be improved. If you don’t have an observer, then use a mirror, and/or video yourself and watch the playback. Click the START HERE image above to revise the fundamentals of Historical Stance (contrapposto), Hand Position, and Visions (Ut Pictura: creating an imagined vision of what you are talking about in the text to be performed). If the text includes any kind of visual description, plan ahead where in your field of (imaginary) vision each element of the picture will be situated. So now you are standing diagonally on to your audience, weight on one leg, the other leg elegantly bent. You are holding your music in your left hand, and your right hand rests palm upwards, midway between your belly button and your chin. Fingers gently curved, middle two fingers brought close together, little finger curved more inwards, index finger less curved. Imagine you are holding a tennis ball in your hand – that gives a feeling for the right amount of curve and strength (just enough, no excess tension) in the fingers. Lift up your hand, palm outwards. Now let your arm swing gently and slowly down-up, about one second in each direction, i.e. two seconds for the complete down-up movement. This is how 17th-century musicians understood the measurement of rhythm: down for one minim, up for another, so that the complete down-up cycle last a semibreve. Your best human estimate of the duration of one second will be sufficiently precise: they didn’t have stop-watches and digital metronomes in Monteverdi’s time! 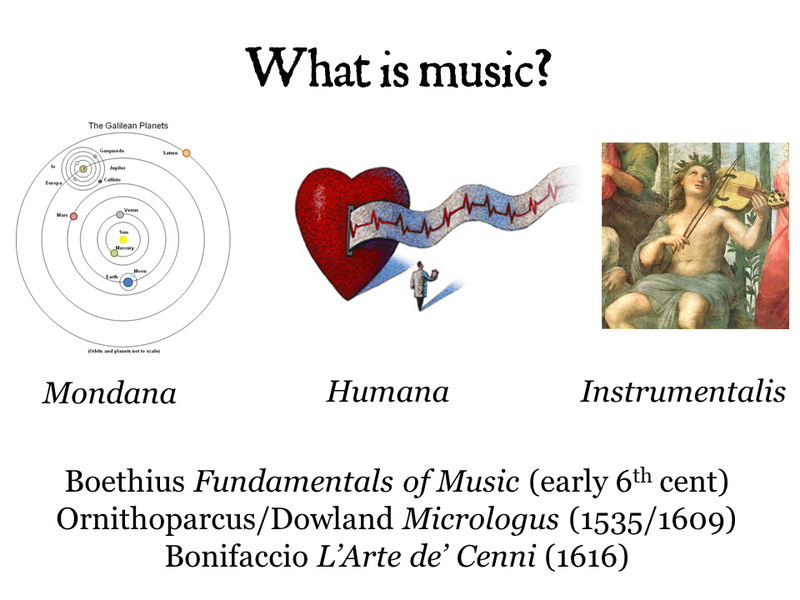 As you move your hand, consider that musical rhythm (musica instrumentalis) was a symbol also for the harmonious nature of the human body (musica humana): let your arm swing with the quiet constancy of a heart-beat. Rhythm also symbolised the perfect motion of the stars and planets (musica mondana), moved by the hand of God: let your hand move gently, but with the profound significance of cosmic force, and with divinely-ordained authority. This period philosophy of Music does not make you, the Tactus-beater, a demi-god who can alter Time and divert the sun on its course, at your whim. Rather, it gives you a weighty responsibility, to maintain a steady beat so that the heavens do not collapse, to sustain the pulse for the sake of the health of all humanity. Now sing your song through, paying attention to keeping the Tactus beat as constant as you possibly can. Don’t let your hand follow the voice! Rather, use the gentle power of Tactus to keep your singing in rhythm. It should feel rather like singing jazz, in that there is a strong, steady swing as the foundation for whatever longer or shorter notes you actually sing. Your observer (or you yourself, watching the mirror or video playback) should check for steady, smooth hand movements, and for a clear sense that the ‘hand of God’ is in command, with the human voice conforming to the Tactus pulse. Even with a song you know well, it is quite possible that this exercise might reveal some places where your rhythm was not steady, as measured by the Tactus beat. You may well find that the composer’s note-values are more varied than you had realised. Without the discipline of a steady Tactus, most ‘free’ performances tend to reduce contrast: long notes are cut short, short notes are not fast enough, rests are disregarded. As a preliminary exercise for Baroque Gesture, Tactus-beating gets you accustomed to moving your right hand, and breaks the connection between hand-movement and voice-production, a connection which is often created by modern singing teachers or by gestural practices in romantic music, but which is unhelpful for Early Music. Nevertheless, there are certain freedoms, inside this slow Tactus beat. If the music is set syllable by syllable, then note-values notated equally can be subtly varied, according to the weight of each syllable. Where note-values are unequal, it is often good to emphasise that difference: make the long notes extra-long, the short notes extra-short. 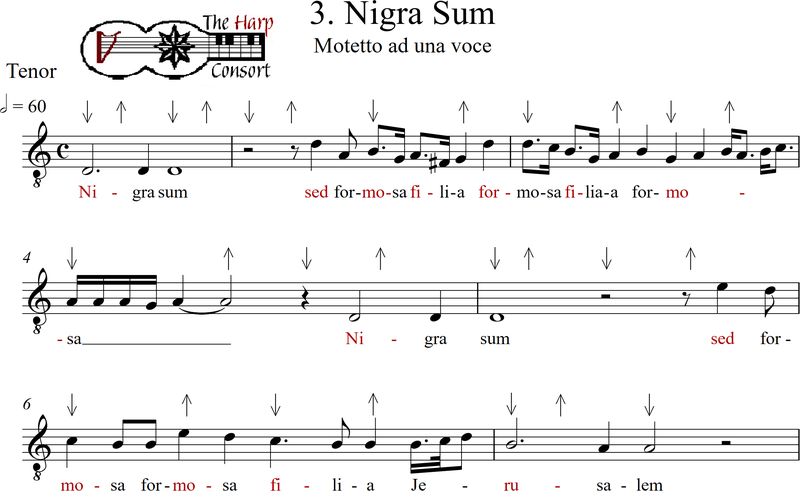 If there is a melisma (several notes on one syllable), you are free to play around with the note-values: see Caccini’s Le Nuove Musiche (original print here, my translation and commentary here) for examples of how to do this. All of these freedoms operate within the bounds of the steady Tactus. Finally, there is a stylish special effect, which is to maintain the Tactus pulse, but deliberately to sing off the beat, like a jazz singer making syncopations. 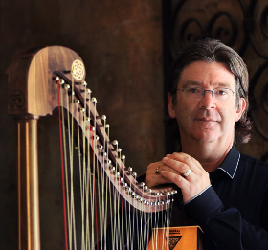 Read more about Monteverdi, Caccini & Jazz here. I recommend strongly that you leave this for later, concentrating to begin with on establishing and maintaining the steady Tactus. 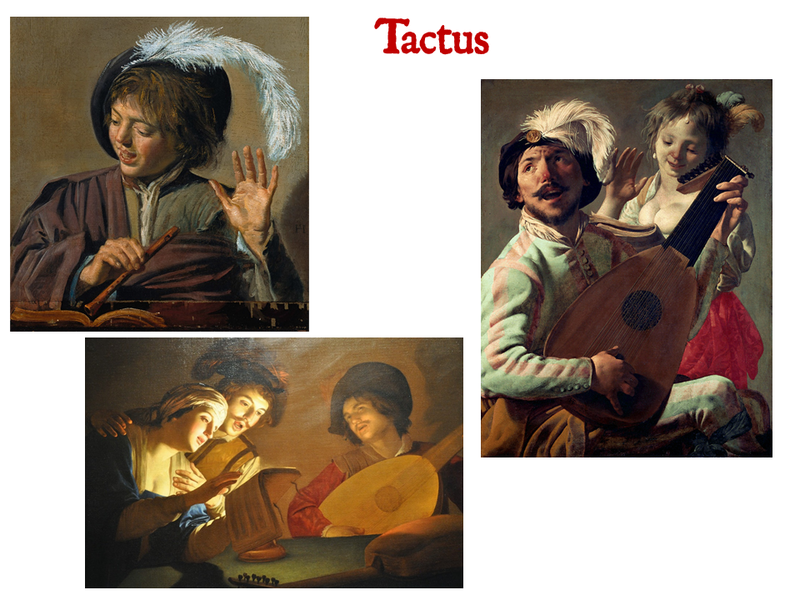 The images above show a recorder-player using Tactus-beating to study a piece, and singers using Tactus-beating for songs and ensembles. In his seventh (1619) book of Madrigals, entitled Concerto and full of varied ensembles here, Monteverdi marks the dramatic solo recitatives as ‘in theatrical style’ in genere rappresentativo and ‘to be sung without beating Tactus ‘& si canta senza battuta’. The implication, of course, is that conventional madrigals and other ensemble-pieces would have Tactus-beating. The anonymous c1630 MS Il Corago here agrees that Tactus-beating was not used in dramatic recitative, but that in a staged show, the principle continuo-player might beat Tactus for large-scale ensemble music. Music with ‘divided choirs’ (Gabrieli, Schütz, the Monteverdi Vespers etc) would have multiple Tactus-beaters to unify the Tactus across large spaces. So this Tactus-exercise is something that can also be used in performance, but would not be used in a dramatic solo recitative, especially not on stage. For Nigra sum and Pulchra es, it would not be wrong to beat Tactus, but there are probably better and more beautiful things to do with your hands. Read on…. Word-based musical phrasing, and word-based baroque gesture starts at the fundamental level of syllables, accented and unaccented – or to use the period terminology, Good and Bad. 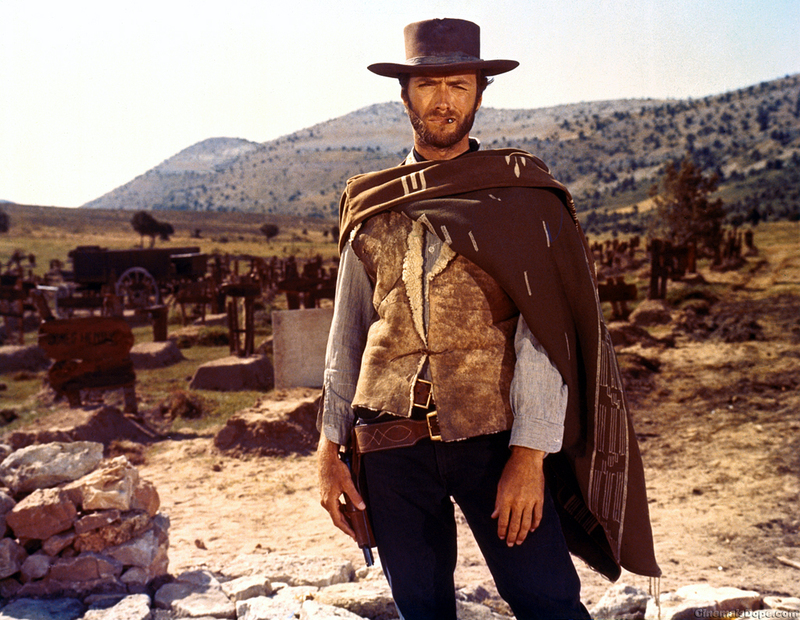 Read about The Good, the Bad and the Early Music phrase here. The idea of this exercise is very simple: move your hand on the Good syllable, not on the Bad. It is more difficult to do, than you might think. Most singers find it easy to move the hand on a Good syllable, but harder to do nothing on the Bad syllable. The hand movement, with the Right hand, begins from the Start Here neutral position, with the hand resting palm upwards, midway between your belly button and your chin, holding that imaginary tennis ball. On the good syllable, move your hand outwards, and slightly upwards, as if offering the tennis-ball to another player, standing in front of you and slightly to your right. On the Bad syllables, let your hand remain still. Not tense, as if the tennis-ball has become a lead weight, and you are desperate for your partner to take it from you! Just relaxed and still, with nothing happening. This is perhaps the hardest element of the exercise, to learn who to do nothing. On the next Good syllable, let your hand move again, either a little further outwards, or back towards the central resting position. Whatever feels natural – you don’t want your arm to end up too extended, but if there are several Good syllables in quick succession, you might not want to reverse the movement for every one. At the end of a strophe, or at the end of the whole piece, let your hand fall gently to your side. This shows the end of a section. Try this exercise several times, just speaking the text. Then try with singing. Particularly when singing, the temptation to move on a Bad syllable can be hard to resist. Practice until it is easy and natural to move your hand appropriately. It’s fairly easy to make a movement on each Good syllable. Check for false movements (or attempted movements) on Bad syllables, in particular small unaccented words (e.g. et) or final syllables (e.g. fi-li-A). Check also for unnecessary tension during Bad syllables, when the hand should be resting. Singers will find it helpful to shorten unaccented final syllables, rather than sustaining them for the full written value of the note. This is anyway good style. I invented this exercise as an aid to the musical performance, to help singers establish a clear sense of Good and Bad syllables. 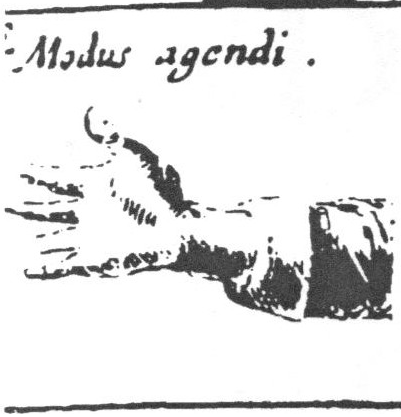 In that context, the hand-movement is merely an outward and visible sign of the inward thought-processes. Using a hand-movement helps singers concentrate on this question, and allows both singers and directors to observe the level of success. But Gesture was itself described in period treatises as ‘an outward and visible sign’ of the inward movements of the passions of the spirit. So this exercise is also useful preliminary training for gesture, establishing the connection between Word and Action, between a Good syllable and the Stroke (the well-timed focus of movement) of a gesture. By doing the exercise first whilst speaking, the non-period connection between hand-movements and vocal production are broken, and a new connection made between Text and Action. Make sure that the gestures remain text-based, even when you start to sing. This next variation of the exercise develops the ability to ‘shape’ long notes with a messa di voce, as well as increasing one’s awareness of subtle shaping and the Stroke of gestures. Sing your song once again, moving your right hand on the Good syllables (and not on the Bad). But now, move your hand slowly and further, making a long gesture for a long note; move your hand less and somewhat faster, for a short note. For a very long note, the gesture should match the ‘shape’ of the note by starting slowly, and moving to a Stroke at the moment where the bloom of the crescendo and vibrato happens. Although this is not yet completely historical gesture, I suggest that it can already be effective in performance, helping the performers focus on Good syllables and beautifully-shaped long notes. But if you can incorporate the results of the next exercise, so much the better. Read on…. Try this exercise several times, speaking, before attempting to combine everything at once with singing as well. As you pronounce the Good syllable of each word, focus your mind on the meaning of that particular word. This soon becomes a Mindfulness exercise, in which you seek to keep focussed on each particular word in that very moment, without being distracted by what happened previously, or what is about to happen next. 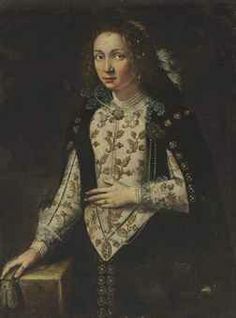 Two historical concepts can help you with this: Enargeia (the emotional power of detailed visual description) and Visions (an imagined picture of what you are describing in the performed Text). As you sing formosa filia, imagine how the the ‘beautiful daughter’ looks, and locate this imagined figure precisely in your field of vision. An appropriate place, keeping in mind the etiquette of a renaissance court, which carried over into the conventions of theatrical practice, would be in front and to your right side. Similarly for amica mea: you can locate your imaginary ‘friend’ forward right. 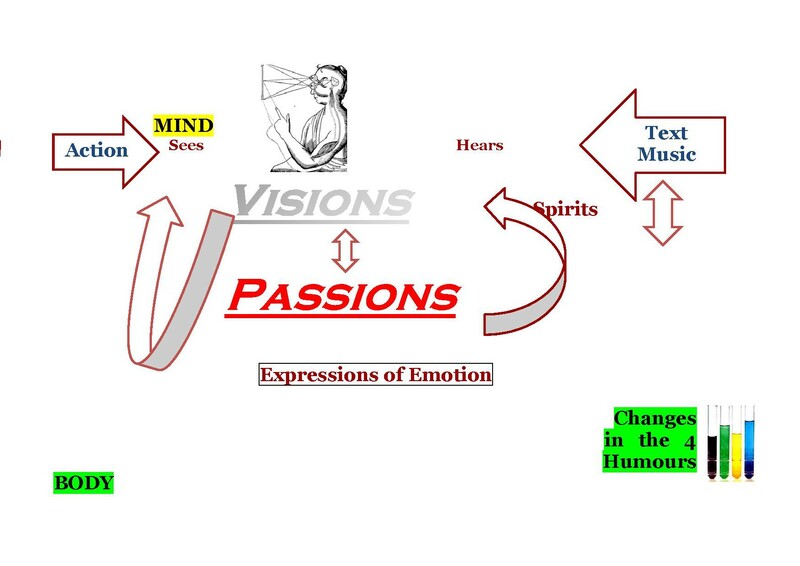 The combination of all these elements is what I call the Ut Pictura technique, borrowing from a favourite period expression, ut pictura musica (music is like a picture). As you sing the Good syllable of each word, you concentrate on the meaning of that particular word, and you imagine, with as much detail and precision as you can, how the resulting ‘scene’ looks, with a specific location for the particular elements you are currently describing. For an attentive observer, it quickly becomes very obvious, whether the singer has a specific meaning and a detailed picture in mind as they pronounce a certain word, or not. Sometimes singers have the translation of the text written into the score, or buried somewhere in their memory, but not available to them in the moment of performance. Sometimes, under pressure, one can be distracted away from the particular word at hand, perhaps thinking about a difficult note in the next bar, or whatever. Sometimes, singers will pronounce a word meaningfully, but have no specific visual imagination of it, or no particular location for it. It’s worth considering that attentive audience members will also be able to notice whether or not you are fully committed to the meaning of each word, and have an inspiring Vision of it. This applies even when singing in your native language. This exercise too was invented as an aid to musical delivery, attaching deep meaning to each word being sung. As singers start to acquire the skill to do this, you will notice the enormous difference focus on Meaning makes for passionate performance, and you will probably be unwilling to accept anything less, in the future! As an exercise for Gesture, establishing connections to the Meaning of each word is an obvious pre-requisite for satisfying Shakespeare’s demand, Suit the Action to the Word. But the resulting hand-movements are more than just a well-completed exercise, they are themselves a basic, Default Gesture, that is thoroughly historical and can be used in performance. Although the actual hand-movement is just a basic to and fro, this is now ‘real’ baroque gesture, and can be used with confidence in performance. 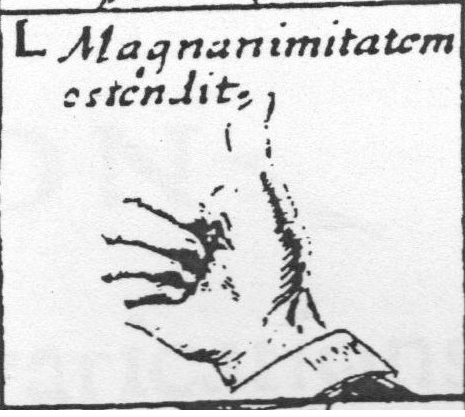 Of course, there are other specific gestures to be learnt and added later, but this basic movement of the hand gently back and forth every few words, is a Default Gesture described by Quintilian (1st cent AD), Shakespeare (Hamlet c1600) and Bulwer (1644). 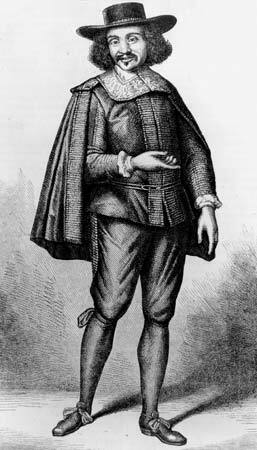 Default Gesture demonstrated by Moliere: initial position. From here, the right hand moves outwards. However, what makes this Default Gesture work is not what you do with your hand, but what you do with your mind. If you fill your concentration with the meaning of the word and an imaginary vision of the scene, all that Enargeia (the emotional power of detailed visual description) will turn to Enargeia (the spirit of passion) transmitted from your eyes and hands to your audience. The force of your own concentration and imagination will change your facial expression, the look in your eyes, and (in indescribably subtle ways) the movement of the hand gesture. Default Gesture (2) Moliere again: the right hand has moved outwards, and is now ready to return again to the initial position. For total success, you need to synchronise all these elements – pronunciation, meaning and vision, the gaze of your eyes and the movement of your hand – with the music, i.e. with the steady beat of the Tactus. So try the song again, with a partner to beat Tactus for you. Or you could ask your accompanist to play in absolutely steady Tactus, to keep you in time. According to Agazzari in 1607 (original here, my commentary here), the role of the continuo is to direct the entire ensemble. If you can synchronise all of this, you really have unlocked the secrets of early Baroque performance, and you are ready to go on to more advanced gestures. This last variation is really only a party-trick, but it might help you realise that combining all these elements is quite a challenge, a challenge which deserves sustained practice over months and years. Try beating Tactus with left hand, and doing Default Gesture (Good syllables only, coordinated with the length of the note, synchronised with the meaning of the word and supported by a precise Vision of the scene) with your right hand. This would not be done in historical performance, but it is a (very demanding) drill that combines everything you should have learnt from the exercises in this post. The next article in this series, Baroque Gesture: What’s the Point? is here.